When it comes to cost-effective, premium quality interior painting in Charlotte, North Carolina, Zelaya Jr Painting is the interior painting contractor Charlotte residents and businesses trust for their home or commercial space. Zelaya Jr Painting's Charlotte painters specialize in all Charlotte interior painting jobs, including interior walls, ceilings, doors and trim. We also paint and seal garage and basement floors. 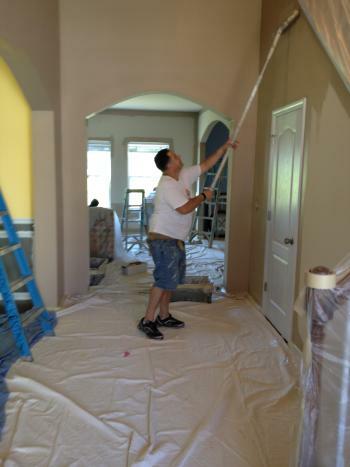 Whether you are looking to freshen up your interior rooms with new paint or have a more elaborate interior painting project to complete in Charlotte, NC, rest assured that Zelaya Jr Painting's Charlotte interior painting technicians are up to the task! Whether your Charlotte interior painting project is large or small, you can trust Zelaya Jr Painting's Charlotte interior painters to complete your Charlotte NC interior painting project on time and on budget. 5★★★★★ - "In December 2018 Frank and his team painted the entire interior of my 2200 sq ft 70's ranch home. They prepped the trim and walls everywhere (everything looked well worn before they began) and the result was absolutely beautiful. He has a sizeable crew and they did all of this in 2.5 days. Cost was a bit better than 2 others who would have taken longer. Add to this that everyone was really pleasant, always greeting me with a smile. Excellent experience." 5★★★★★ - "These guys are just incredible. Prompt, so respectful, excellent communication, desire to please and amazing work ethic from everyone. A year ago they scraped every square inch of popcorn ceiling from our 3700 sq ft house. It was hazmat professionally done. They covered all of our floors and walls with plastic to protect them from the mess. They certainly know what they are doing. Also, they cleaned the entire house upon completion. Thank you, guys! But seriously...scraping, sanding and painting 3700 square feet!!! It was no small feat!! Wow. Incredible job. A year later we called Franklin and his team out to paint two spaces in our home including the formal living room and the informal living/stairway. It was quite a bit of painting and they somehow got it all done in ONE DAY. It was immaculate. Beautifully done. Cannot wait to call them again for more projects. Very fair pricing. Big fan." 5 ★★★★★ - "I can’t say enough good things about Zelaya Jr. Painting. Franklin and his crew did the entire interior of my house. Fantastic job and the compliments from visitors and neighbors has been non-stop." 5★★★★★ - "Franklin and his team are very professional and friendly. They attended to every detail with care and expertise. Great job!" 5★★★★★ - "Franklin and his team were amazing! Not only were they professional, punctual and polite but their job was beautiful!!! I have a 2 story den with 20 foot ceilings and they were able to expedite our job bc we had a time crunch for moving. Not only did they do a beautiful job but they even got done earlier than expected. I highly recommend Zelaya and will definitely use him again. He has a customer for life!" 5★★★★★ - "What a gentleman, the owner, Franklin is at Zelaya Jr. Painting. He and his team did great painting and repairs of several rooms in our home. There were a lot of windows, doors, and trim so it was a challenging job. I highly recommend them!" 5★★★★★ - "Zelaya Jr. Painting has a great team. We hired them to paint several rooms in our home, including the ceilings. There were a lot of windows, doors, and trim, so It was a challenging job. The entire crew worked hard and were very respectful. The owner, Franklin, is a real gentleman. We are happy with the job well done." 5 ★★★★★ - "Franklin and his team painted the whole interior of my house, including ceilings. They were on time, clean and repaired cracks and other drywall where it needed it. Highest quality of paint used. I love it!" "Zelaya Jr Painting is a good painting company. They did my interior painting, and they restored my pool. They did an excellent job I recommend Franklin. He is honest guy and he gives reasonable prices." "Franklin is a very good painter. He did a wonderful job. He paints my kitchen and my dining room. I will use him again. I recommend Zelaya Jr Painting." 5★★★★★ - "Franklin and crew arrived on time, did an excellent job....and charged a reasonable price. Highly recommend them our front doors look like new!" 5★★★★★ - "Franklin and his team provided a competitive quote and were able to start the next day. They completed the job very quickly but to a very high standard. All of the team were so friendly and polite. I have no reservations about recommending this firm and will definitely use them for my next painting job." 5★★★★★ - "Franklin Zelaya was recommended to me for painting my kitchen cabinets. He and his crew did an awesome job. They were very careful about protecting everything else in the kitchen. They were very polite and he made sure that they did everything perfect. They are very trustworthy and you would be choosing well by choosing Franklin and his crew to paint and do anything else necessary in your house"
5★★★★★ - "We had our garage painted inside and out. The painters completed the job in record time. The painters were a pleasure to work with. We really like the fresh new look!" 5★★★★★ - "Franklin Zelaya's team painted our medical center. They worked around our schedule, never left a mess, and did a fantastic job! I was so pleased I contracted him to paint some rooms at my house. We also contracted to him to build a deck for a hot tub. He did a fantastic job on the deck and the painting. His prices beat every other estimate, his crews are fast, professional, and friendly. I felt like I was on "fixer upper" when the job was finished!!! I highly recommend hiring Mr. Zelaya!!" 5★★★★★ - "Excellent service - interior & exterior painting, deck staining, powerwashing." 5★★★★★ - "Zelaya his team did an awesome job on my house! They were ontime and had the whole job finished in less than 48 hours. I was beyond pleased with the quality of work. The paint job looks so good. I have no complaints what so ever. I would absolutly use them again in the future! Their prices were very fair and they are willing to work with you to stay in your budget. So impressed." 5★★★★★ - "Zelaya Painters did a great job at my house. They worked quickly, while still being very meticulous in their work. I had 5 rooms painted and they all look beautiful and at an affordable price. We will definitely hire them again for future painting needs." 5★★★★★ - "Zelaya Jr Painting did some painting, patching, wallpaper removal, power washing, and deck staining. Franklin is a real nice guy, honest, and dependable. He does what he says he is going to do." "I am pleased with the nice job of Franklin and his crew did on my house and my stores. He did a great job for me. He did interior painting in my house and my two stores. I will definitely recommend him." "Franklin is a real nice guy, honest, and dependable. He does what he says he is going to do. He removed wallpaper in a condominium. He did all the repair on drywall and paint all interior condos. He did a great job. I will use him again for any reference." "I am very satisfied with the good quality of work that Zelaya Jr Painting has been done in my house Franklin is a very kind of person there he do all the prepping real good they use the quality materials and paint my house is 10.000 sf and he also paint my factory I will use him again and I refer him to anybody."